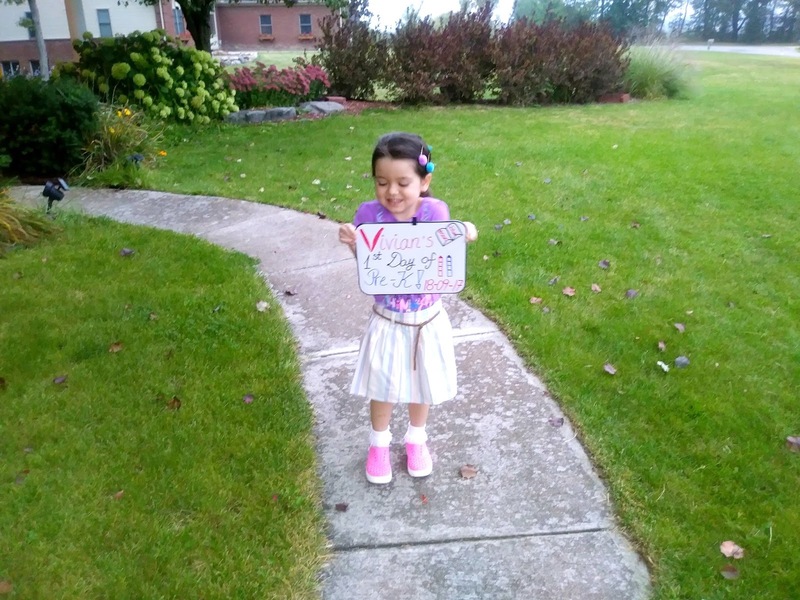 Vivian's First day of Pre-School. Today was Vivian's first day of school ever. 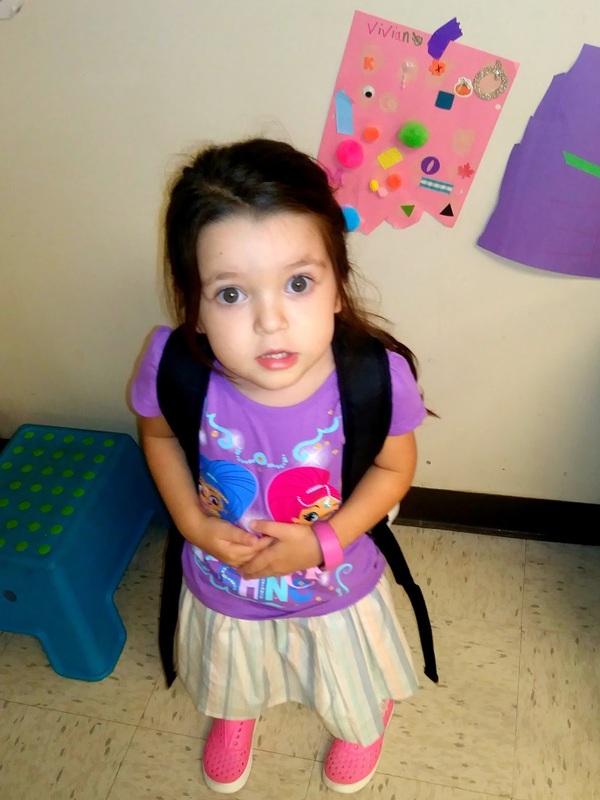 She is a preschooler and this mama cannot believe it. Viv has a very long journey in front of her but I have absolute faith in her: she is intelligent, smart, witty and intuitive. She will do great! As a matter of fact her first day of school went real well. She chatted and made friends all day and she even drew a nice picture and made a beautiful craft paper (I will show you below, in a picture). 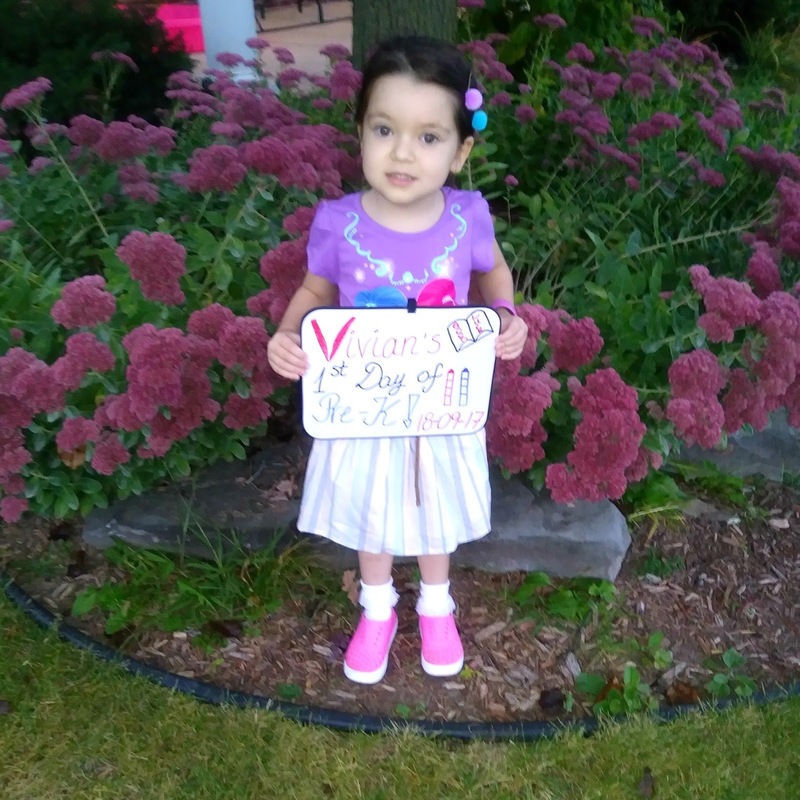 To tell you the truth, words cannot truly explain the emotions I felt today - September 18th 2017 - her very first day of school. I was happy, joyful, nervous, scared, and in some ways it felt surreal. And if I am not lying, I cried a few minutes after I said goodbye to her and we hugged and kissed. This photo totally shows my girl sassy side and sparkly, fun personality! She is too cool! 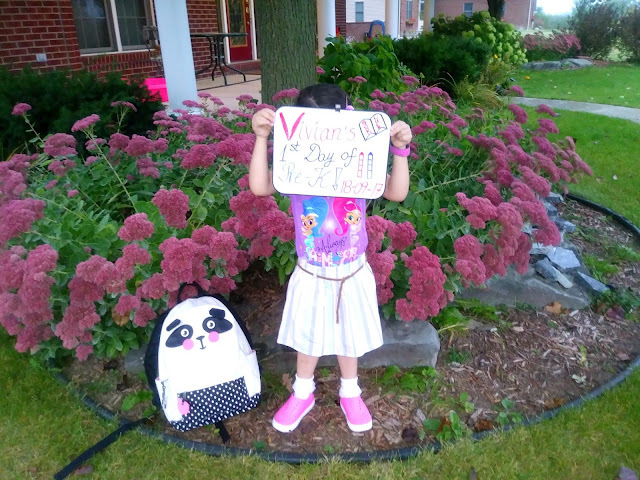 Now I always have thought that choosing an outfit for the first day of school is important - a tradition I have personally loved each year when I started school. 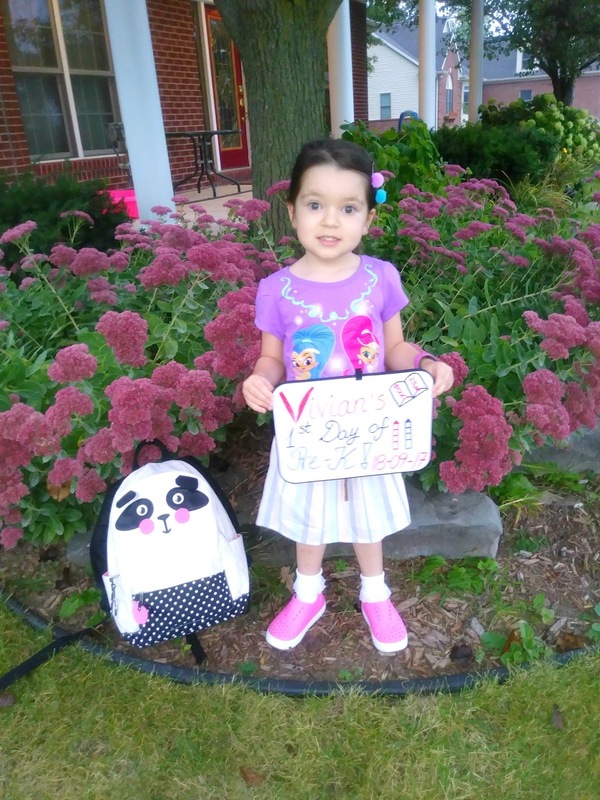 The first day of school is indeed important. I wanted an outfit that was new, comfortable, colorful and fun like my daughter and which represented her well. We both worked on putting her first-day-of-school outfit together. I picked out the skirt, hair barrettes and bow that matched her "Shimmer and Shine" graphic tee, which she chose on her own with two of her favorite characters from this Nickelodeon show. 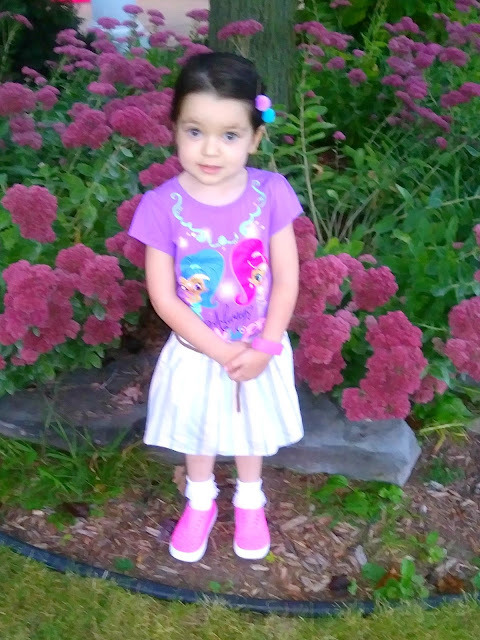 Viv also chose the shoes and socks - she always calls little ruffle-trimmed socks "ballerina socks". I think we did well. This outfit did indeed suit Vivian as a person, her girly style, the fact that she loves colors and it was also a warm day yesterday in the mid 70s so short sleeves and bare legs it was. 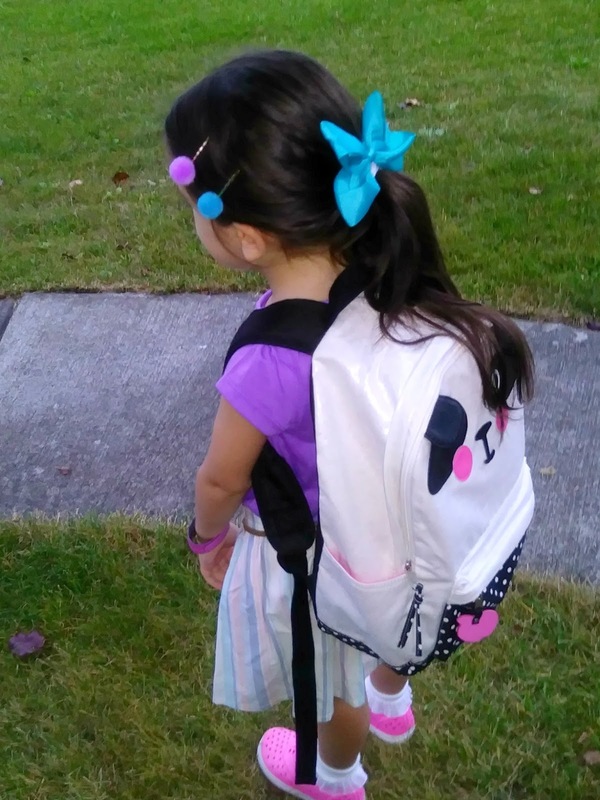 But I think a very important detail of her outfit for her first day of school is hands-down the backpack. 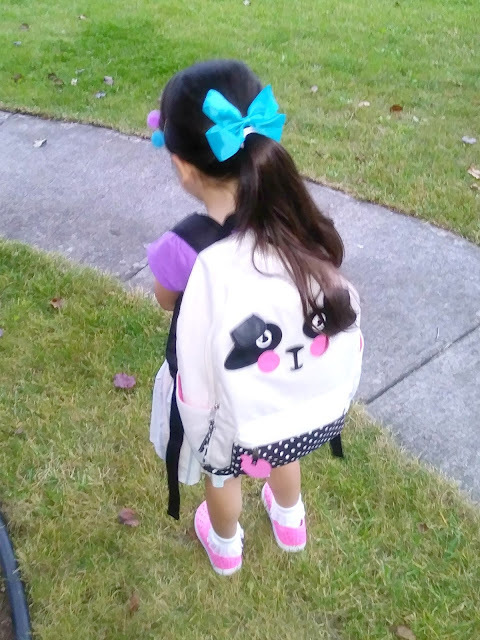 Absolutely love her White+Black Shimmery Panda Bear Backpack I found at Target from the incredibly cute Cat+Jack brand. 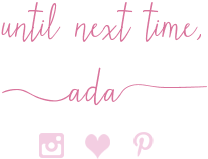 It ios trimed with bright pink and it is also lined in bright pink. The size is perfect for Vivian too. 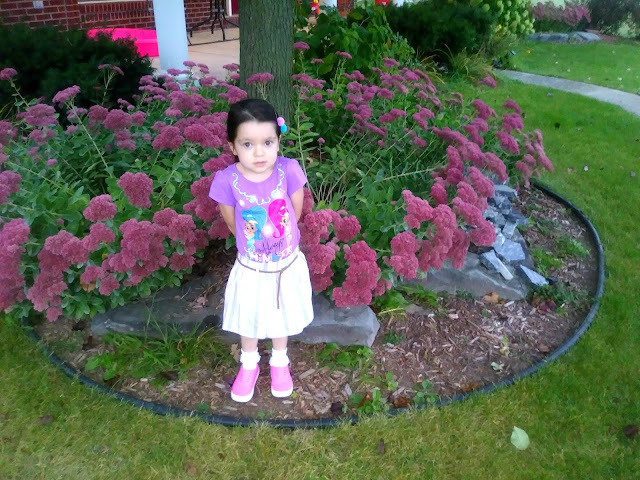 What do you think of her outfit for the first day of pre-school?! If you have a pre-schooler, how did you feel when they started Pre-K and do you have any tips to make things easier for both them and you?! 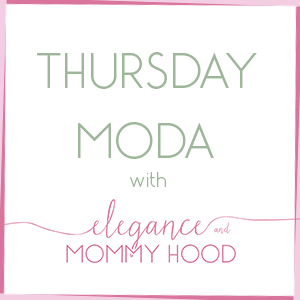 Any tips on changing and re-arranging your daily schedule?! The pink craft paper hanging on the wall is what Vivian made on the first day of school. I am not surprised she chose a pink paper as that is her favorite color. She drew some things on it and decorated it with glitter, colorful pieces of paper and pom poms. Purple "Shimmer + Shine", Short-Sleeve Graphic Tee: Nickelodeon (New). White Skirt w/ Baby Blue + Blush Stripes (comes with the tan belt): Carter's (New). White+Black Polka Dot Panda Backpack: Cat + Jack via Target (New). Purple + Teal Furry Pom Pom Barrettes (come in a pack of 6): Charming Charlie (New). Teal Blue Big Bow Barrette (on her ponytail): Wal Mart (New). White Lace-Ruffled Socks: Wal Mart. Bright Pink+White Plastic Jelly Slip-on Sneakers: Natives. 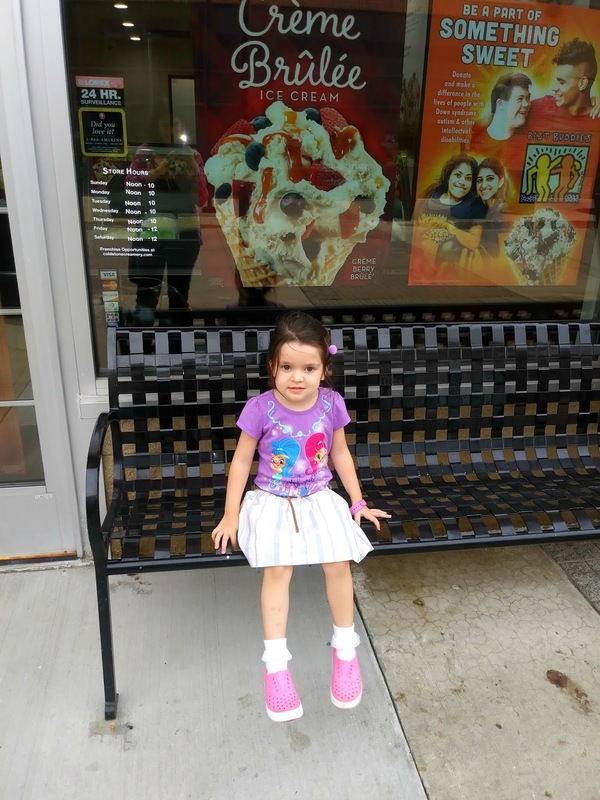 Afterwards I took Vivian for a treat and we both ate Cold Stone ice-cream - neither one of us have had in months. It was yummy, cold and delicious. It was the perfect way to wrap my busy day of work and her long, busy first day of preschool. 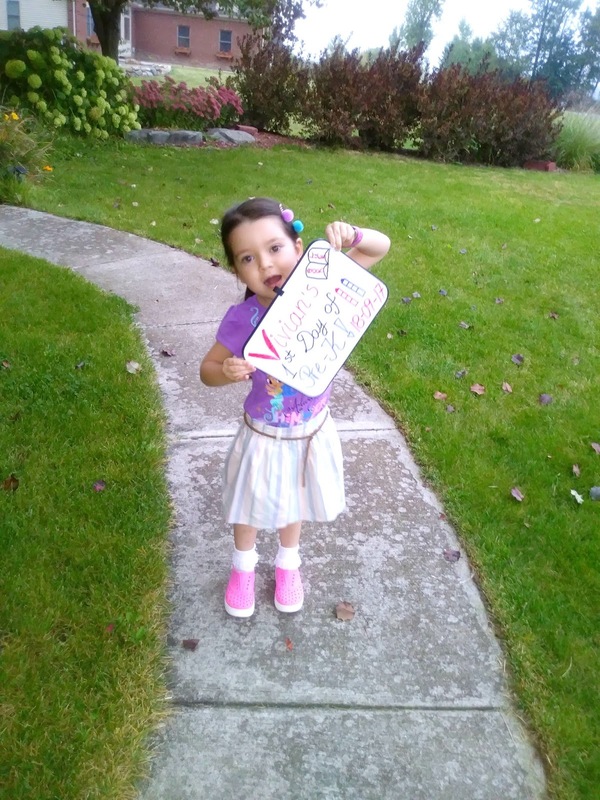 I hope you all have a great new week and it is a wonderful, smooth first school week for my Vivi!! Cheers to Tuesday!